For many years we have explored the multitude of the physical benefits of yoga, and of course, the very calming effects of meditation. But maybe you, like me, have also heard whispers of ‘energy’ in your yoga class... Or perhaps you’ve felt something that was a little beyond the realm of the ‘normal’ and physical? Now, we’re all familiar with energy – it is everywhere around us, from the light bulbs in the ceiling through to our phone battery. And we even have many, many, ways of generating it, from nuclear fusion through to wind and waves. But – that energy is not what we mean when we talk about prana. In a nutshell prana (an ancient sanskrit term) refers to our vital life-force or energy. Pranayama is said to be the way for us to tap into that energy and enhance it for a better quality of life. The amazing thing about prana is that it is not some kind of ‘stuff’ which has a form. Energy is simply the ‘potential’ that can cause a change. For example when there is little energy, there is little potential for change. However, a high energy event (physically or emotionally), has the potential to create a huge amount of change in our lives. The ancient yogis realised that our longevity is not measured by the number of years but, in fact, by the number of breaths that you take. They found that if you learn to extend your breath you can also expand your life force, and therefore you also have the potential to increase your life span. Learning to control and increase your pranic energy through active engagement with the breath is what we call pranayama. Fascinatingly different breathing techniques have very different effects. For example increasing or decreasing the number of breaths, holding between breaths, or even controlling which nostril to inhale and exhale from, causes a wide variation in the mood and health of the practitioner. Documenting and handing down this knowledge became the legacy of the ancient yogis of India and beyond, and in the West it is now known as, The Science of Pranayama. Think of pranayama like a mystical formula whereby you can alter the quantity and quality of ingredients: the breath length, the length of the pauses, the ratio between in and out breath etc. to create certain desired outcomes. The science of pranayama is taught in many stages here at Dru. On our Dru Mediation classes, courses and retreats we introduce you to simple mindful awareness right the way through to controlled breath retention. We’re here to guide you through a journey of magical exploration into your own prana and how, with practice, you can, amongst other benefits, learn to calm your mind and boost your energy levels at will. Pranayama can help you to increase the field of energy in and around your body. This in turn supports your physical form, helping you to feel healthier and more vibrant as well as energising your emotional and mental layers which means you’ll be more alert and experience happier, more joyful emotions. When the pranamaya kosha (or energy layer) is strong you can also begin to perceive it with the mind as bodily sensations, like heat, coolness and tingling. It’s interesting to realise that the kosha level we function from at any given time determines our perspective on ourselves and the world around us. But the quality of that experience is determined by our pranic levels. If we have high prana at any of the 5 layers, we will have rich, bright, vibrant experiences. Low levels of prana, however, brings dullness, lethargy or dysfunction. Increase your levels of prana by consciously engaging with your breath. Start to notice and observe (without controlling it too much) things like; “where in your chest has most expansion?”, “do you breathe down into your belly?”, “are you a mouth or nose breather?”. These quiet observations can already begin to calm your mind and emotions. 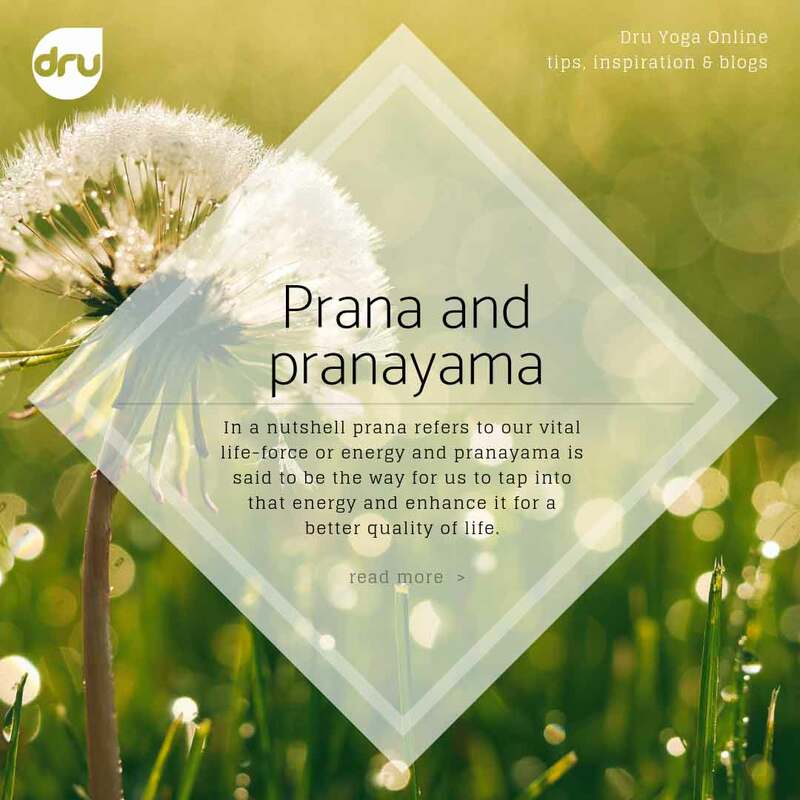 Want to try some pranayama? Pranayama has many benefits, and, depending on what technique you do it can help you to focus your mind, prepare you for meditation, energise your digestion as well as reduce anxiety and stress and lower blood pressure. It’s important that you don’t move to quickly when you first begin a pranayama practice, so please take your time and develop your practice gradually. Most techniques are suitable for everyone, however there are certain contra-indications which must be observed and should any problems develop from your practice of pranayama you must stop. Discontinue the practice for a few days and seek advice from one of your yoga teachers. To get you started with a pranayama practice watch this video on the Windmill Breath class with Nanna Coppens on the Online Yoga Studio. It is a perfect way to start to exploring pranayama.